Corona’s history is tied to the first product we manufactured, the AG 5050 Orange Sheer, which we still make today. This tool was formerly called, and still remembered by many, as the “9B Orange Clipper”. The 9B Orange Clipper is linked directly with the U.S. citrus industry, which started near Corona in the city of Riverside. The U.S citrus industry was started near the city of Corona, California. The orange trees loved the local environment and the local people loved the fruit. As production grew, citrus growers established marketing organizations designed to sell even more fruit but those sales were limited by how long it took fruit to get to market and remain in good condition. Transit to the east coast by rail was taking 15 days and the fruit condition on arrival was marginal, so finding ways to cut decay and speed transit time were a priority. 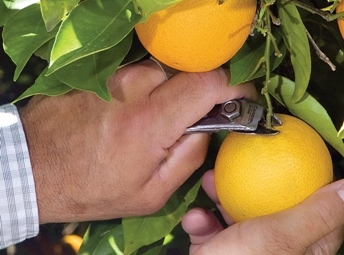 Citrus shippers had noticed that fruit that was “handled with care” in the fields and packing houses tended to produce better arrival conditions after an extended journey. Since better arrivals meant a better market price for the fruit, the growers and shippers started to develop methods of handling fruit so as to limit the damage done to the fruit during the harvest and packing processes. One main contributor to decay was damage to the skin that could introduce bacteria and encourage mold growth. So processes that contributed to skin damage were getting a close look. The focus on field handling caught the interest of a school teacher in the Corona area. He realized that much of the skin damage on the oranges came from the oranges themselves. All of the fruit was harvested by hand. The fruit was literally pulled off of the tree. This resulted in openings in the skin if the fruit button (where the stem connects to the fruit) was pulled off in the process. The skin also was damaged in the field, and in the packing house, when the stems that remained on the fruit were allowed to scratch and poke other fruit. So the school teacher had a vision, and that vision was the first moment of conception for Corona. He thought that if the fruit could be picked by a cutting tool, instead of being pulled, the fruit would retain its button. If the tool had a curved shape, it could cut the stem right at the button and eliminate stem fragments and the damage caused by the attached stems. Well, the teacher turned his idea into a hand tool design that could do exactly what he had envisioned but he was a school teacher, not an inventor and certainly not a tool maker. So, he turned over his idea to the local citrus community. The tool needed to be built, and that task fell to a blacksmith working in the back of one of the local citrus packinghouses. A blacksmith was needed to do the fine workmanship required to develop such a small, precise and durable tool. The blacksmith process not only forms metal, but the repeated heating and pounding yields a product that is significantly stronger than the steel was to start with. This process is called “forging” and these forged steel citrus harvesting shears were put into use and were a perfect solution. The blacksmith refined the design and became the supplier to the California citrus industry — and Corona was born. Corona today is the leading manufacturer in developing top quality tools for all gardening and landscaping needs.